The Fairfield is a fine-gauge cotton sock with a sheep and sheep dog design. Can be worn for any occasion, equally at home with a suit and dress shoes, or jeans and casual shoes at the weekend. The Fairfield is a fine-gauge cotton sock with a sheep and sheep dog design. Can be worn for any occasion, equally at home with a suit and dress shoes, or jeans and casual shoes at the weekend. £3.50 - All standard deliveries are dispatched via Royal Mail First Recorded at a cost of £3.50 and will be delivered between 1-3 working days. A signature is required upon delivery. £6.95 - Your order will need to be received by Scott-Nichol by 12:00 noon, Monday - Thursday and your order will be delivered the next working day by 17:00. £9.50 - Your order will be delivered within 5 - 7 working days. A signature is required upon delivery. £20.00 - Your order will be delivered between 7-10 working days and will require a signature upon delivery. £25.00 - Your order will be delivered between 2-3 working days via UPS. RETURNS: To return an unwanted item for a refund please return in saleable condition with the completed exchange and returns form within 28 days (Orders placed in December can be returned up until the end of January). Your statutory rights are not affected. 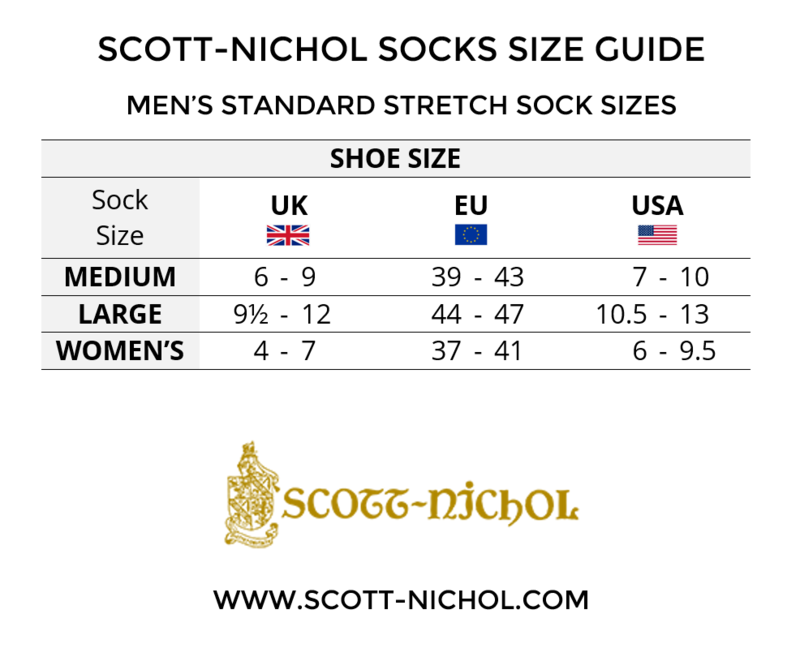 For advice or help purchasing Scott-Nichol socks on our website, please call our telephone helpline or use our Online Enquiry Form to contact us via email. Scott-Nichol socks are made by Pantherella - the finest sockmaker in the World. Buy your Scott-Nichol socks direct from the factory, for the widest range of men's and women's Scott-Nichol socks - including all your regular Scott-Nichol favourites as well as our limited edition seasonal stock. © 1937-2018 Scott-Nichol. All Rights Reserved. Scott-Nichol is part of Pantherella International Group - the World's Finest Sockmakers.